24-hour forecast: Cloudy with sunny breaks today, a few showers or isolated thunderstorms will occur mostly over northern and inland areas. Cloudy at times tonight and tomorrow morning and sunny with cloudy periods tomorrow afternoon. A few showers and isolated thunderstorms will occur in the south and some coastal areas tonight and tomorrow morning then showers and thunderstorms will occur inland tomorrow afternoon. Today: Winds: E-SE 10-20 kts. ; seas: Choppy - moderate. ; waves: 3-6 ft.; a few showers or isolated thunderstorms. Tomorrow: Winds: E-SE 10-20 kts. ; seas: Choppy - moderate. ; waves: 3-6 ft.; some showers and isolated thunderstorms. Marine Outlook: Thursday night:- Winds: East 10-20 kts. ; seas: Choppy - moderate. ; waves: 3-6 ft.; some showers and isolated thunderstorms mostly over the south. General Outlook: Cloudy skies with some showers and isolated thunderstorms mostly inland Thursday and over the south and along the coast Thursday night. 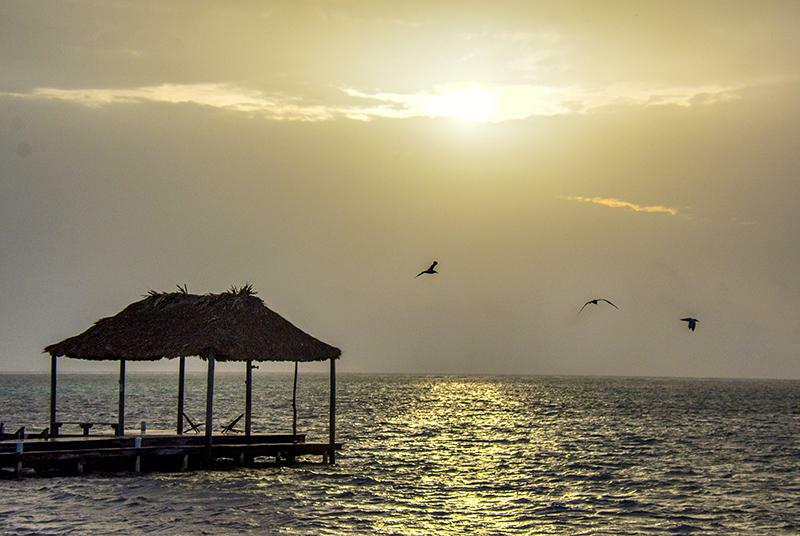 Ambergris Caye woke this morning to a thunder shower. Our expected high is 87. The wind is ESE at 8 mph. The Rain band yesterday was both caused by and pushed back by the Easterly Caribbean wind. . . .As night time came, the Caribbean wind eased, so the scattered rain areas, moved back over Belize. . . .Now breaking up into many smaller scattered showers over most of Belize. There is a small area of ITCZ activity building up over central & southern Belize, brining thunder showers. The Easterly air flow from Africa, had a large ITCZ area build up over South America earlier (Circled), but is now dying down.
. is now moving WNW away from land. Belize City saw a very slight sprinkle overnight but since June 1st, very little rain.